With the NBA offseason well underway, Tyreke Evans’ name has come up a lot as of late after he was acquired in a sign-and-trade deal that sent him to the New Orleans Pelicans. During this time there was something that Evans did that was overshadowed by his new contract with his new team. Just days after the Pelicans made the signing of the 6-foot-6 guard official, Evans was in a Sacramento gym spending time with the local youth at VSP Tyreke Evans’ Basketball Camp. “It feels good. I mean, it’s only two days but me and the kids, we have a lot of fun, you know? They get to see me one last time before I go off to New Orleans, so just to get to see the kids’ faces and to hang out with them, it’s exciting,” said Evans, the 2010 NBA Rookie of the Year. “The kids come in and are so excited, so it feels good to me to get this opportunity to show all of these kids that hard work does pay off,” he continued. 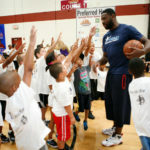 VSP Tyreke Evans’ Basketball Camp is a free basketball camp for children from low-income and underserved areas of Sacramento. Although it is only a two-day camp, the free camp gives underprivileged children a chance to play basketball with one of their idols, learn the basics about the game and life, and even get a free eye exam. “It’s good to have this free camp for the kids because they have something positive to look forward to, plus they can get their eyes checked for free, which helps them play sports. Most of them come here and have never had their eyes checked before and some of them need glasses, so for them to come here and get their eyes checked it helps them a lot,” explained the Chester, Pennsylvania native. Despite spending so much time away from home for the past six years because of his basketball career, Evans has never forgotten about where it all started, where he came from, or the people that have supported him since the beginning. He still finds time to go back home to visit all of his friends and family and even makes some stops at local high schools to talk to the kids that are in the same position that he was once in. “I wasn’t just doing stuff in Sacramento. I go back to my hometown a lot, which means a lot to me. I go around to about, like, 6 schools and talk to the kids there,” explained the former 4th overall pick from the 2009 NBA Draft. Whenever Evans goes back home to visit, he gets a reminder of what he had to go through just to make it to where he is today. He understands the opportunity that he has been given and takes full advantage of it. As someone who wasn’t really involved in community and charitable events until he reached the NBA, Evans has found a new love and passion for giving back and is making the most of his time as a professional basketball player by doing whatever he can to get out into the community. Tyreke Evans definitely made his mark on the Sacramento community during the four seasons that he was a member of the Kings. Despite all the talking and rumors that went on away from the court during his time in Sacramento, Evans always looked past it and always gave the Kings and the Sacramento community all that he had. Besides his annual free camp, Evans was a part of other charitable events like poker tournaments and glasses drives, to name a few, to do whatever he could to help better someone else’s life. He even managed to get VSP Vision Care to visit his hometown with him to help give back to his local community. Now, with Evans on the move to New Orleans, it will be the first season of his professional career that he will not be spending with the Kings. With that being said, Evans is unsure about next year’s free basketball camp due to him relocating. One thing that is for sure, however, is the fact that Evans is willing to be a part of the camp, no matter what city it is hosted in. Changing from the Hornets to the Pelicans isn’t the only change that the New Orleans basketball club made this offseason. Aside from the sign-and-trade deal that the team made with Evans and the Sacramento Kings, the team went out and traded their 5th overall pick Nerlens Noel and their first-round pick in the 2014 NBA Draft to the Philadelphia 76ers in exchange for Jrue Holiday and the rights to Pierre Jackson. They also went out and signed former Minnesota Timberwolves big man Greg Stiemsma and also acquired rookie center Jeff Withey from the Portland Trailblazers in the Evans sign-and-trade deal. One thing that Evans brings to the table is his ability to work with others, on and off the court. He is eager to get out into the New Orleans community to help better the lives of those who support the New Orleans basketball team on a nightly basis. He is currently unsure of how he is going to make a difference, but he’s up for the challenge to help better a community that has been through so much adversity. With Evans recently inking a four-year deal with the Pelicans, the team is looking a lot stronger. With the amount of talent that the Pelicans have right now, Evans will play a key role for the organization both on and off the court. Although the name on the front of his jersey has changed, Evans’ dedication to the game, the team he is representing and the city that is supporting him will not. If anything, it is only going to grow larger.